just found this article and it’s excatly what I’m right now trying to do. Do you probably have a few minutes to help me configuring the connection between nagios and influxdb? Somehow I’m right now at a dead end and no longer have an idea on what else configuration to try. I’m trying to use graphios to send data to the graphite backend of influxdb, but I don’t know how to configure the graphite section of the influxdb correctly to store this data. Greeting from Switzerland and already thanks for an reply! Graphios supports many backends (graphite, influxdb, etc). You need to enable just one of them. Below is my InfluxDB config section of graphios. Altough InfluxDB is at a newer state, the influxdb09 should work with the latest release ). # Extra tags to add to metrics, like data center location etc. # defaults to 127.0.0.1:8086 (:8087 if using SSL). I am trying to setup the same stack that you illustrate in your article. I notice that the #influxdb_servers = 127.0.0.1:8087 entry is commented out and the user name / password options are blank. Do you also enable the line protocol, or is this section sufficient with all others set to false? What listener did you configure on the Influxdb side? Thanks you for writing this! The section as mentioned should suffice in a default setup. InfluxDB is listening @ 8086 by default. The only thing you need to do, is to create a user on the influxDB server and to enter these credentials in the config file mentioned above. Nice post, and agreed that that stack sounds like a solid fit, picking & choosing the best from each layer. That said, you didn’t really delve into the ‘how’ of the implementation. Care to share? Since the setup is already done, and InfluxDB heavily under development I have my doubts about a complete setup guide that will work 100%. From my experience; I found the Nagios configuration the hardest part. The other components are pretty well documented on their originating sites. This is also the layer that I find the most doubtfull, since Nagios is a kind of fossil. If you’re starting fresh, and don’t have many servers, I would advice you to take a look at Telegraph for metric collections, which is a lot easier to setup and has more/better metrics out of the box. Thanks for such a great document I was also able to configure using influxdb, but the influxdb version supported by graphios is 0.9 which is to old now and lack many features is it possible to make it supportable to latest versions. Thanks for such a great write up. Its really helpful..
We also have similar requirements like mentioned above & planning to build the stack from scratch. So can you pls advise if Nagios will be good option , or we can consider some other tool as well. Nagios is the most doubtfull layer, for sure 🙂 For me it is some heritage I have to work with. Configuring Nagios can cause lots of headaches. So if you’re setting up from scratch, and only for a few servers or so, I would advice to use Telegraph which is easier to setup and has more and better metrics. 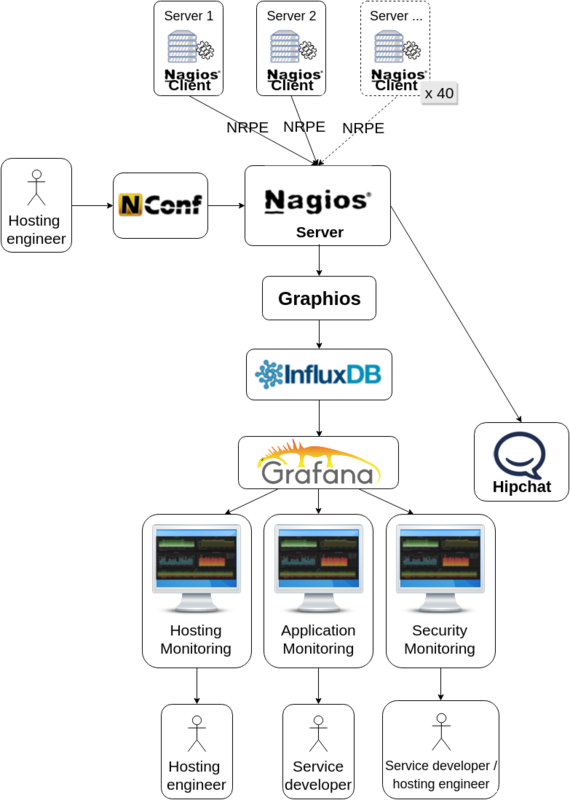 Why are you using Nagios and not Icinga2 which has native support for InfluxDB? Ok, I will install both icinga2, telegraph and collectd to understand which is the best for my processes. I’m interested on Network Monitoring .. have you got ideas for that? Not entirely sure about which part of networking you mean, but for traffic the Netlink plugin for Collectd or the built-in network plugin in Telegraf should suffice for that. This is the exact solution I was looking for!! Can you post on what is the sequence in which this Stack should be up? I am new to this tool stack. Great article to get going. I have Nagios XI in place, I have installed Grafana on a testing machine along with InfluxDB on the same testing machine. How can I send Nagio data to InfluxDB or have InfluxDB to pull Nagios data to disaply on Grafana?